Ben Jordan has been transformed by the corporate MonkeyGames Entertainment into a goth-punk anti-hero who is after some serious paranomal wrath. Relive the original Case 1 with an edgier, bloodthirsty BJ. Music in the game created by Tweaker, some Nine Inch Nails guy, apparently, and the music is featured in games like American McGee's Alice and DOOM3. Featured screenshot not in the game, but it's the Photoshop that started the whole idea. Download contains extras including a metal version of the Percival Jones theme composed by the mighty Ghormak (who did the soundtrack for Ben Jordan cases 1-4)! PS - This is an joke game originally made for April 1, 2005. 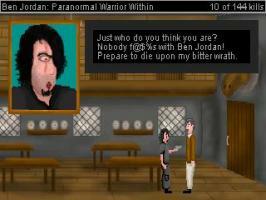 "A fun little parody game for fans of Ben Jordan."